As an online marketer, you have to be creative, and one way to pick up sales and improve online marketing campaigns is by testing. It’s the first step in the optimization process since you will be using actual client feedback to improve how you do things. What Are the Different Test Methods? 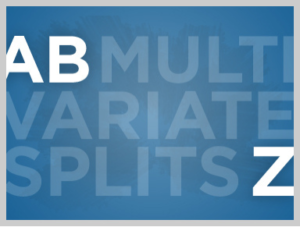 Webmasters commonly use two testing methods: A/B or split testing and multivariate testing. A/B testing is the simpler choice of the two, as only two options will be presented to the site visitors during the duration of the test. And between these two versions, only one variation will be made. 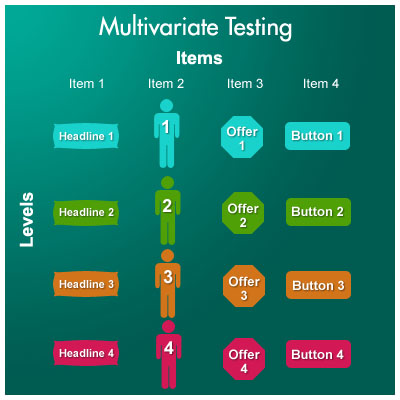 Now, take A/B testing as it is, multiply it several times over to create multiple runs, and you’ve got a multivariate test, which is where you try out a number of variations all at once. Unlike the A/B testing, there are no limits to the number of elements that you can vary. People are extremely diverse, so coming up with a campaign that will appeal to the vast majority becomes a complicated process. Testing aims to simplify this by offering a step-by-step process to allow marketers to figure out what their customers want in a timely and orderly manner. Multivariate tests accelerate the campaign optimization process since they allow more than one change to be made. Aside from that, they prevent marketers from adopting a cautious state of mind when it comes to trying out new ideas, since they place no limits on the number of elements that can be modified. Running a multivariate test is simpler nowadays, thanks to the availability relevant software. Some tools are available online for free, while others that are more feature-filled can be purchased for a premium. You can choose to run the tests yourself or hire a third-party service provider, if you prefer. 1. Assess your email marketing campaign. Before anything else, go through your previous email copies and list which parts can still be improved. For starters, you could choose to test your email subjects, headings, sub-headings, banners, and calls to action. These are some of the most crucial parts of an email that can increase conversions when they’re used properly. 2. Design variations for your test. After you’ve gone through this list, group elements that can be tested out together, and set up a test schedule for each of these groups. Once you’ve decided which group to do a test on, create the content and variations for the test. 3. Run your multivariate test. When you’re ready to run your test, upload the variations into the email marketing program or mail manager you’re using. Send one version to one half of your list, and the other version to the other half. Monitor the email’s click rates and sales leads using your email manager. Pull up the data when the test period is over, and use it to determine which variation got you better results. Take note of these results and implement the changes in the next emails that you will be sending. Even if you feel you’ve found the perfect combination of subject line, headings, design, and calls to action, your work isn’t over. Preferences change as your email list grows and time goes by, so it’s important to use multivariate testing periodically to keep your content fresh and results high. Ruben Corbo is a freelance writer that writes about technology, gaming, music, and online marketing especially topics about A/B Testing and how to run multivariable testing. Ruben is also an avid gamer and music composer for short films and other visual arts.